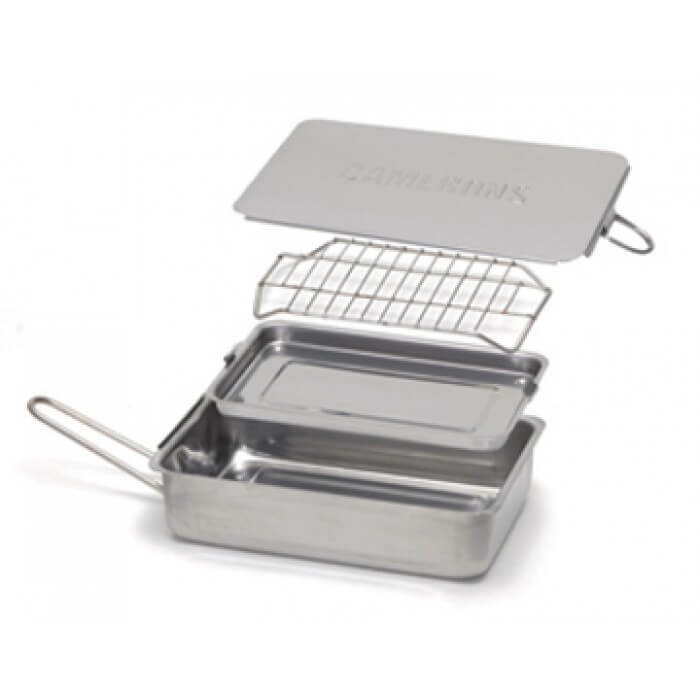 Camerons Mini Smoker is a great way to infuse healthy, smoke-cooked flavor into meat, seafood, and poultry dishes, even vegetables, without the use of fats, salts, oils, or extra calories. Retain food moisture and natural cooking flavors so foods don’t toughen or dry out. 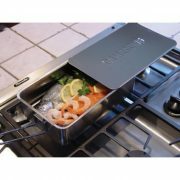 Doubles as a steamer – two great cookers in one product. 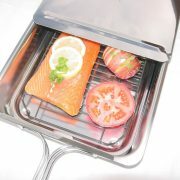 Hot smoke in minutes right on your own stovetop! 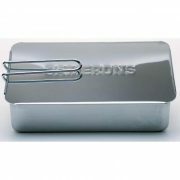 Prepare delicious, moist, smoke-flavored dishes quickly and without fuss. 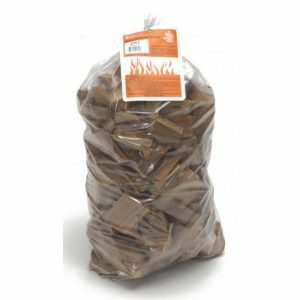 Smoke salmon, chicken, meats, and vegetables with your choice of included wood chips. Perfect for a small family or a special dinner for two! Smoke-cooking is a healthy way to infuse flavor without the use of fats, salts or oils and that means no added calories either. Our smoker allows you to hot-smoke food, a process that retains moisture and natural cooking flavors so foods don't dry out or get tough. 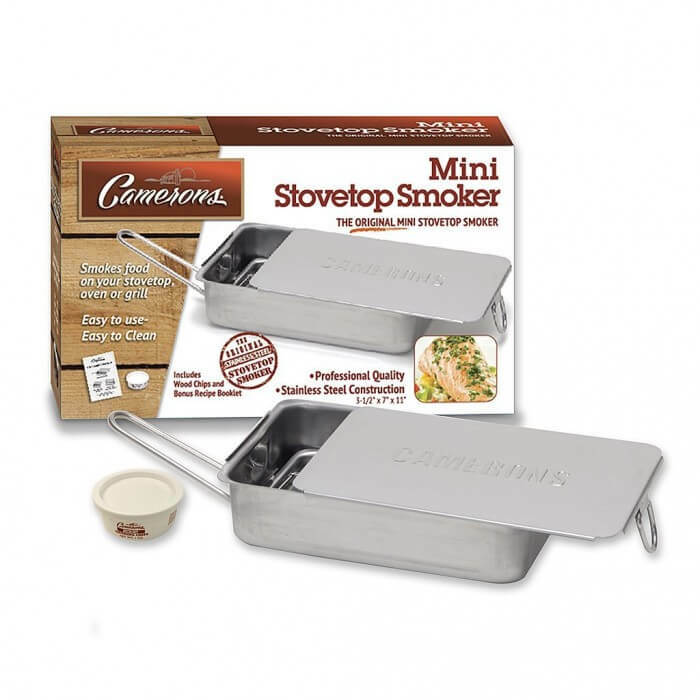 Camerons Mini Smoker also doubles as a steamer, so you really get two great cookers in one product! Camerons Mini Smoker works great with all meat, seafood, and poultry dishes and it transforms ordinary vegetables into delicious main courses! 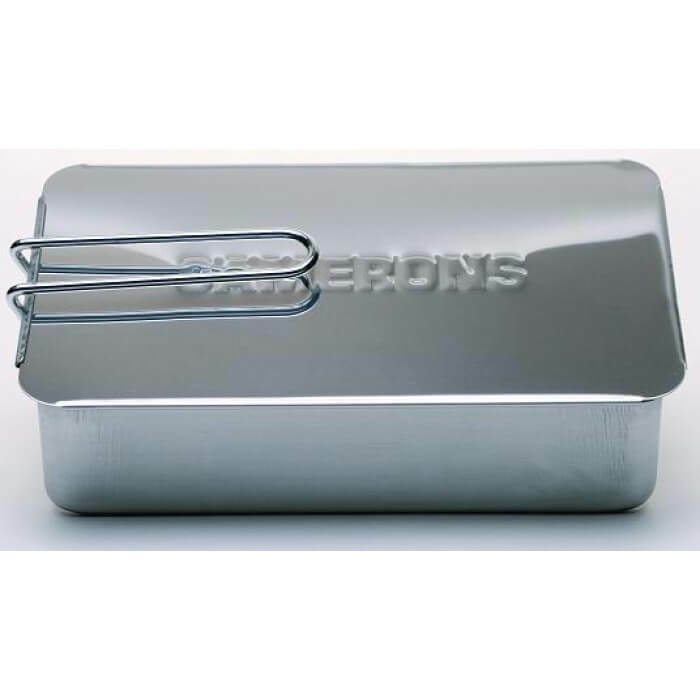 Large items like turkeys or hams can be smoked as well by simply making an aluminum foil tent to cover the item when you cook it, instead of using the smoker lid. Includes - Stovetop Smoker, Stick-Free Rack, Drip Pan, Lid, BONUS Wood Chip Sample, and Recipe Guide! Awesome product. I have given as gifts to friends since I like mine so much. 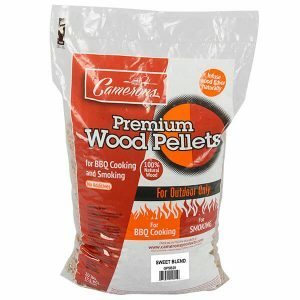 This is a great product and I have used it many times for ribs and whole chicken. I bought this for myself, but found it too small to fit a decent (2 lb) size rib rack or even a small chicken (5 lb). I would highly recommend getting the standard size version. 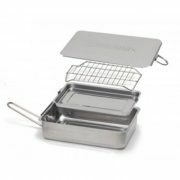 When using this smoker, I would also recommend allowing the meat to “dry out” in the refrigerator a day before by placing it on a plate. 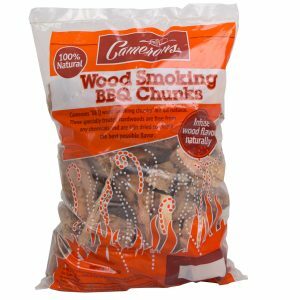 I have found that the tray included is really not deep enough to contain all the meat juices and they end up spilling over into the wood chips, reducing the smoke and creating a really big mess! My granddaughter gave me your mini smoker for my birthday in September. I must say that it is the best outdoor product I have ever used. The selection of fuels needed to cook and the variations of cooking meathods it offers is unbelievable. 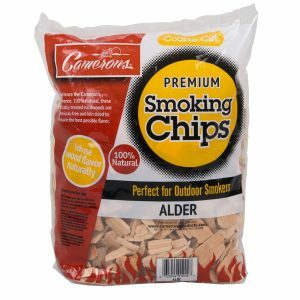 You certainly came up with a winner in this pruduct.I have worked in sales for 30 years and never have I seen a product for outdoor use that compares to this. A friend gave me one of these for my birthday last September. I thought it was ‘unique’ but probably not something I would use on a regular basis – that is, until my family decided they wanted to eat more fish! I am not a fan of ‘fishy’ fish, but I had thawed some store-bought salmon filets, and with a glaze made of Inglehoffer mustard, lemon juice and fresh dill, I put the fish in the smoker. And 25 minutes later – voila – out came the most delicious smoked non-fishy tasting fish, cooked perfectly with no added fat or salt. I will be using this smoker again and again! Wonderful idea! 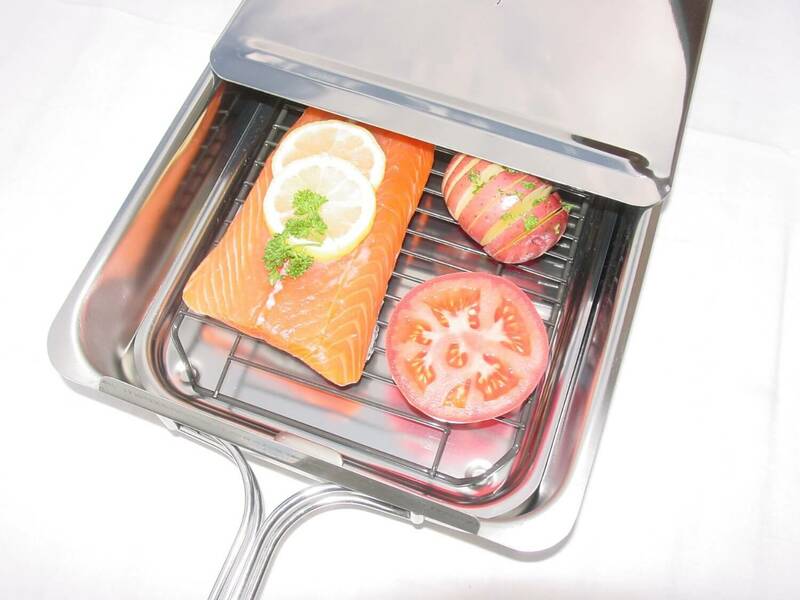 We love smoking salmon! I just ordered one for my brother and sister for Christmas gifts. My nephew might even like using it on his Boy Scout camping trips. This really is a nifty piece of kit. Got it as a pressie and we love it. We’ve done pork chops, small joints, teabags, trout. It really is so easy to use and so effective. Chops and fish can be done start to finish in around 30 minutes. Obviously, the mini is a small device which is fine for a couple of people doing chops or fillets. Having seen how well it works I’m tempted to put one of the bigger versions on the wish list.